Keeping an eye on the EAS Sports Nutrition/NWCA National Duals presented by Hibiclens and the United States Marine Corps in honor of Cliff Keen. The Division I National Duals was founded as part of the Virginia Duals in Hampton, Virginia in 1989 as the National Dual Meet Championships. In 1991, the event began to rotate around the country with the oversight of the National Duals handled by the National Wrestling Coaches Association. Since 1989, 10 different cities have hosted the championships entirely or served as a championship finals site. Cedar Falls, Iowa had the longest consecutive run of hosting championships, with six straight years from 2006-2011. This year’s final host, Iowa City, has hosted the event previously in 1998 and 1999. Over the past 26 years, the team championship trophy has only been hoisted by six programs – Oklahoma State (8 titles), Minnesota (8), Iowa (6), Penn State (2), Cornell (1) and Iowa State (1). Iowa, Minnesota and Cornell all look to win another dual team championship this season. This year’s format melds a regional concept born a few seasons ago with a championship weekend site to fully expand the reach of the event. Eight regional sites hosted play-in matches on Feb. 14-15, and the winners of those eight duals qualified to go to Iowa City for Finals Weekend. The eight qualifying teams have been seeded according to their ranking by the USA Today/NWCA Division I Wrestling Coaches Poll on February 17. The semifinals and finals will be shown live on the Big Ten Network. Seven of the eight teams competing in Finals Weekend are ranked in the Top 12 according to the USA Today/NWCA Division I Wrestling Coaches Poll including the top five teams. Iowa, Missouri, Ohio State, Minnesota and Cornell are ranked in the top five (as of February 17), while other ranked teams include No. 11 Lehigh and No. 12. Chattanooga was ranked earlier this season. With the seven nationally-ranked teams competing at Finals weekend, the event will have showcased 85 nationally-ranked wrestlers in two weeks. Three returning national champions all competed – Illinois Jesse Delgado at 125 pounds, three-time champion Logan Stieber of Ohio State at 141 pounds and J’Den Cox of Missouri at 197 pounds. The field will contained 25 total returning Division I All-Americans and 37 additional wrestlers with NCAA post-season championship experience. Iowa and Ohio State each bring a lineup entirely comprised of nationally-ranked wrestlers. Both the Hawkeyes and Buckeyes have all 10 starting wrestlers ranked by the various ranking services. Missouri has nine individual wrestlers ranked, while Minnesota has eight. Cornell and Illinois have seven ranked wrestlers each. The eight teams competing in Finals Weekend have a combined 113-19 dual meet record this season. Iowa and Missouri are the nation’s last two unbeaten teams. The Hawkeyes are 15-0 while Missouri has the most wins in Division I this season, winning all 21 of its dual meets. BTN will offer live coverage of the National Wrestling Coaches Association (NWCA) National Duals’ Quarterfinals, Semifinals, and Finals. On Saturday, the quarterfinals will stream live for free on BTN2Go beginning at 1 PM ET. The semifinals will air live at 4 PM ET on BTN & BTN2Go, while coverage of the consolation mats will stream for free on BTN2Go. On Sunday, the finals will air live on BTN & BTN2Go beginning at 12:30 PM ET. Third-place matches will be streamed live for free on BTN2Go. To access BTN’s coverage, please visit the NWCA streaming schedule here. Fans can download the free NWCA National Duals Digital Magazine, complete with news, notes, rosters and relevant info for the event by clicking here. Each dual will bring some intriguing matchups, whether it be from a rankings standpoint or just general intrigue. On paper, the top-ranked Hawkeyes are heavily favored to advance with 10 nationally-ranked wrestlers in the lineup and a heavy home-mat advantage. Two of the top matches in this dual should come right off the bat as nationally-ranked wrestlers Thomas Gilman of Iowa and Sean Boyle of Chattanooga will square off at 125 pounds. Boyle’s using his final year of eligibility to compete at Chattanooga after finishing in the Round of 12 during his sophomore season at Michigan. Iowa All-American Cory Clark could get a battle from Chattanooga’s Nick Soto at 133 pounds. Soto’s been ranked for most of his career and has qualified for the NCAA championships three straight years. The hero of Chattanooga’s win over Oklahoma was heavyweight Jared Johnson. He topped nationally-ranked Ross Larson in a wild 12-11 bout, but he’ll have a stiffer test coming with two-time All-American and Midlands champion Bobby Telford. A rematch of last year’s championship final won by Minnesota 24-15, the dual features eight wrestlers who have been All-Americans during their collegiate careers. Minnesota boasts five of them – Chris Dardanes (133), Nick Dardanes (141), Dylan Ness (157), Logan Storley (174) and Scott Schiller (197). Cornell’s strength comes with two-time All-American Nahshon Garrett at 125 pounds, Brian Realbuto at 157 and Gabe Dean at 184 pounds. Ness and Realbuto should meet up again. Last year, Ness pinned Realbuto in just over a minute. Dean should again be tested by Minnesota’s Brett Pfarr. The two met at the Cliff Keen Las Vegas Invitational with Dean taking a tight win in the tiebreaker. Even though Minnesota does boast All-Americans in half of its starting lineup, the key will be for Cornell to exploit perceived holes in the Minnesota lineup. Garrett, Chris Villalonga (149) and Dylan Palacio (165) have to pick up the slack. Lehigh boasts returning All-Americans Mason Beckman (133) and Mitch Minotti (157), while Ohio State’s lone returning All-American competing this weekend is one of the best ever, three-time NCAA Division I champion Logan Stieber at 141 pounds. Younger brother Hunter was an All-American, but injuries have prevented him from wrestling for most of the season. It’s unlikely he’ll compete in Iowa City. Even with nine wrestlers who’ve not been on the podium at the end of a Division I wrestling season, Ohio State has climbed to No. 3 in the country. The Buckeyes’ only two losses this season came during 2014 with criteria losses. Coach Tom Ryan’s team has seen solid performances from freshmen Nathan Tomasello (125) and Kyle Snyder (197). Tomasello should get a decent challenge from true freshman Scotty Parker, while Beckman will get a stern test with nationally-ranked Johnni DiJulius and his trademark fireman’s carry. Minotti, up from 149 pounds to 157 this year, has been slowed by off-season surgery, but has shown flashes of the talent that pushed him into the NCAA semifinals last year. Other key matches pitting nationally-ranked wrestlers against one another are at 184 where Ohio State’s Kenny Courts and Lehigh’s Nathaniel Brown will meet up in a bout between two Pennsylvania natives and at 197 pounds where Snyder will face Lehigh’s Elliot Riddick. The highlight bout at 125 pounds pits three-time All-American and two-time NCAA champion Jesse Delgado of Illinois against top-ranked and 2013 All-American Alan Waters of Missouri. Delgado missed the lion’s share of the tournament nursing an injury and while still unbeaten, he’s been involved in several tight victories. Waters is unbeaten and is back after taking a redshirt season last year. Missouri’s strength is in the fact coach Brian Smith’s team has essentially no holes. Nine of the 10 starters have NCAA championship experience compared to the six Illinois wrestlers who have competed at the NCAA championships. Illinois should be favored at three of the weights with as many as five bouts having the potential to go either way. Due to the emergence of freshman Willie Miklus at 184 pounds, the Tigers dropped NCAA qualifier Mikey England to 165 from 174 and incumbent starter John Eblen from 184 to 174. Eblen’s match with Zac Brunson at 174 pounds should be a real battle. Illinois freshman Isaiah Martinez is undefeated at 157 pounds and is coming off a fall over Kent State All-American Ian Miller. Missouri also has a hammer at 197 pounds with returning NCAA champion J’Den Cox. Since 1978, no team in the Southern Conference has been as dominant asChattanooga. Overall the program has won 28 conference titles in the past 37 years. The Mocs have won the last four in a row and nine of the last 10. Cornell is one of four EIWA teams in the event and the only EIWA school to have won a National Duals championship. The Big Red defeated Virginia Tech in the finals of the 2011 National Duals 25-10. Illinois finished second in the National Duals back in 2005 in Cleveland, Ohio. 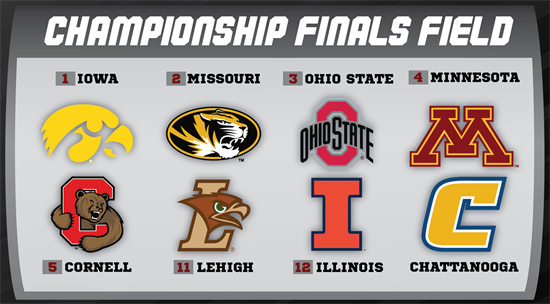 It’s the only time in school history the Fighting Illini have made a championship final in the event. The largest margin of victory by any team in the National Duals came in 1991 whenIowa shutout Division III Ithaca 55-0. During that era, top programs from Division II and Division III were invited to compete at the National Duals, then held in Hampton, Virginia. Wrestling is clearly Lehigh’s signature sport. Their wrestling excellence began in the 1930’s and the small “engineering” school in Bethlehem, Pennsylvania lays claim to 39 Top 10 finishes and 27 individual NCAA championships won by 21 wrestlers. The first came in 1931 at 118 pounds by John Engel. Minnesota will try to set a National Duals record with a fourth consecutive championship. Oklahoma State, Iowa and Minnesota all have won three straight titles during the history of the event, but no team has won four in a row. Returning Missouri NCAA champion J’Den Cox didn’t have to go far to attend college. He hails from Columbia, Missouri and attended Hickman High School, which is just over a mile away from the campus. The only time Ohio State reached the championship finals of the National Duals came in 2002 when the event was hosted in Columbus. The Buckeyes fell to Minnesota 26-8. Tagged Minnesota Golden Gophers, National Duals, NWCA.